Grown-ups enjoy Halloween just as much as kids. And who enjoys treats more than mmj patients and marijuana enthusiasts? Whether you get your treats from a dispensary or make your own, this Halloween, there are a few safety measures every responsible edibles enthusiast needs to remember. From ghastly ghosts and green-faced witches, the trick-or-treaters will be knocking, looking for sugar-coated goodies. It can sometimes be very difficult to distinguish the difference between a medicated and regular treats. Thanks to the legalization and medical marijuana movements, cannabis-infused candy availability is available in more households than ever before. This has Denver police concerned for trick-or-treaters this Halloween. Here are few tips to help keep your cannabis edibles out of the hands of hungry ghouls and goblins this year. 1. Keep purchased edibles in original packaging. Most commercially manufactured cannabis products are required to follow labeling guidelines set forth by the state. Without the original labeling, it can be very difficult to distinguish an edible from a sugary treat. 2. Wrap homemade edibles such as brownies and chocolates in aluminum foil or wax paper. Try to avoid plastic wrap, because it can break down your product. 3. Store wrapped edibles inside an air tight container such as a pyrex dish. Your product will last longer, and will be better protected from the hands of curious children. 4. Label your container with medical symbols or write the word MEDICINE. Even if you have not spoken to your children about marijuana, a medical symbol is a good way to teach your children to keep out of your medication. 5. Always store edibles separately from other sweets and munchies. This is especially important at Halloween time, when large amounts of different candy types are floating around from child to child. Even if you do not have children, make it a habit to keep your edibles stored away in case of unexpected visitors. Do not store edibles in the living room candy dish- in fact, keep all edibles out of plain site. 6. Store edibles in the refrigerator to help keep them fresh. If you have a large amount of edibles, consider purchasing a small refrigerator for storing your medicated edibles. Some state regulatory boards require people to keep marijuana locked away out of reach, so a small miniature fridge stored in your bedroom is a good way to shut off access to your edibles. You might even extend the life of your edible by storing it in the refrigerator. A medicated brownie can last up to two weeks when stored in a refrigerator, but might only last 5 days when stored at room temperature. 7. 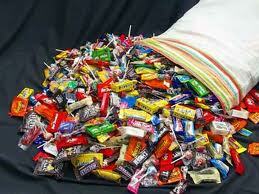 This Halloween, carefully check your kids’ candy bags before allowing them to devour the candy. 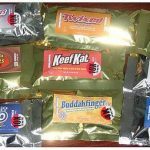 Some medicated edibles look very much like traditional kids candy, so it is important for parents to check the packaging details if in question. Some medicated candies are designed and branded to look like traditional chocolate bars. According to THCFinder.com, candy maker giant. Hershey Company, is involved in a lawsuit against multiple cannabis infused companies for infringement in trademark and branding. Happy October and Happy Halloween! To learn more about medicating with edibles, enroll in our Budtending 101 course! Share your favorite edibles tips, storage techniques, or Halloween stories and we might publish them in the next issue!